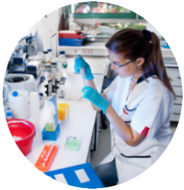 Exsera BioLabs is committed to supporting original research. We feel strongly that such work is the key to changing lives and would be honored to be part of your work. Should you find that your research has progressed to the point where the amount of testing you need is too much for your team or if you think your work could benefit from the testing we offer we would appreciate the opportunity to discuss you work with you. Complement Activation in Patients with Focal Segmental Glomerulosclerosis. Thurman JM, Wong M, Renner B, Frazer-Abel A, Giclas PC, Joy MS, Jalal D, Radeva MK, Gassman J, Gipson DS, Kaskel F, Friedman A, Trachtman H. PLoS One. 2015 Sep 3;10(9):e0136558. doi: 10.1371/journal.pone.0136558. eCollection 2015.